The former site of Liverpool’s historic Garden Festival was back in the news again in February, as work gets under way to restore the parkland and kick-restart the building of flats on the site. This is just another phase in the varied life of this part of the Mersey waterfront, and so in a similar way to the township pages on Historic Liverpool, I brought out a few maps and looked at Dingle through the last 160 years. What I found was a pretty part of town – a real beauty spot – subsequently filled with rubbish and contaminated with oil, then rescued somewhat in the late 20th Century. Perhaps the new developments will do more than previous ones to restore the pleasant air of Knott’s Hole, but I think you’ll agree that something special was lost long ago. As readers of Historic Liverpool may know, the earliest Ordnance Survey maps for Liverpool were drawn around 1850. 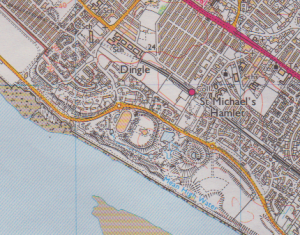 At this time the Dingle area was purely rural. Liverpool lay to the north west, but this was an area of large houses, vast gardens, babbling streams and a long beach. The large houses included West Dingle, the Priory and Dudley House, which sat back from Aigburth Road along narrow lanes. 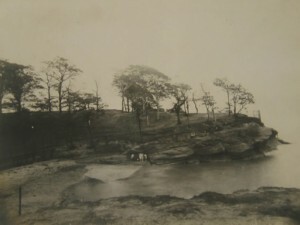 The beach was known as Jericho Shore and stretched from Knott’s Hole in the north west towards Garston in the south east. 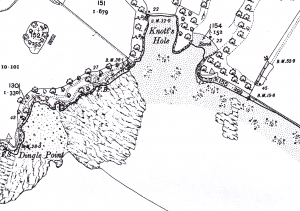 Knott’s Hole itself was a narrow bay or inlet next to where the Dingle flowed out to the Mersey. On either side were steep rocky cliffs, with Dingle Point to the south west. By the time of the next map, published in 1894, Herculaneum Dock had appeared to the north, marking the continued expansion of the docklands across the Toxteth waterfront. Along with this came rows of terraced houses to the north east of the docks, and two hospitals had been built just inside the County Borough Boundary. The lanes down which the large houses sat had developed into a more formal settlement – St. Michael’s Hamlet, including Alwyn Street, Allington Street, Belgrave Street and St. Michael’s Road. The Jericho Shore remained a wide beach. With the increasing urbanisation of the area, by 1928 the stream known as the Dingle had been surrounded by allotments and the area had become quite an orderly part of the grounds of West Dingle, the large house on the hillside. Dense terraced housing was filling in the gaps not already taken up by the large villas, as Toxteth and Liverpool slowly encroached on the rural outskirts. It’s on the 1928 map that the south pier at Dingle Point is marked, and it is this structure which heralds the start of a complete transformation of the landscape, and one which we still look upon today. The first development was an application which was submitted to Liverpool City Council for the dumping of material dug from the Queensway Mersey Tunnel along the river front. It was then that 20-year-old plans to reclaim land from the river were resurrected, and the filling of the land began. 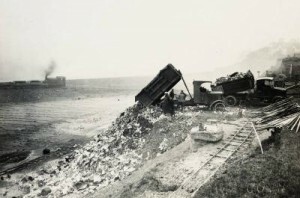 In September 1929 thousands of tonnes of rubble and household waste began to be dumped. The concrete sea wall was complete by 1932, and the land behind it full by 1949. By the time of the 1949 map, a handful of gas storage cylinders had been built behind the pier. This area of the south docks was gradually becoming more and more industrialised, and what had once been a popular fishing destination now found its waters contaminated with oil, andits fish stocks disappearing. Also by this time the houses on the hill had been demolished, Dingle Head having been demolished before 1909. More gas storage cylinders were built in the period up to 1960. Extensions to the promenade (which had opened in 1950) were being made northwards, and the long beach of the Jericho Shore was being reclaimed for building land. 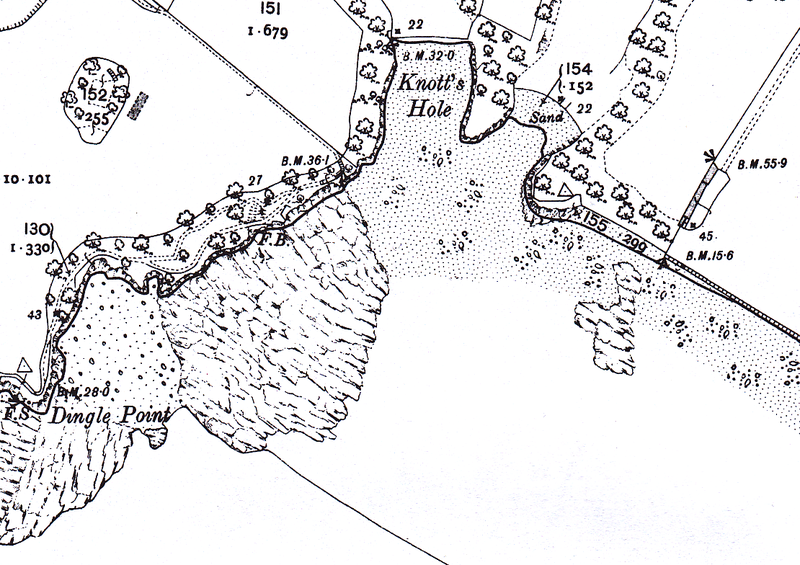 The 1960 map shows the Otterspool river wall creeping northwards in preparation for the promenade extension. By 1964 the beach had totally disappeared, and the area was marked as Sand & Gravel. By the late 1970s the sand and gravel too had gone, along with the gasometers. The railway remained, as did the pier, but nothing more than an embankment marked the area once covered with allotments and cut through with the channel of the Dingle. By the 1980s the whole are had been filled with household waste. This period was a low point in Liverpool’s history. The docks were falling empty as trade moved elsewhere. At the beginning of the 1980s the Toxteth riots had put the eyes of the country on to the social and economic problems in the inner city. For this reason Michael Heseltine, Margaret Thatcher’s ‘Minister for Merseyside’ ushered in another new use for the Dingle. The International Garden Festival took place in 1984 in an attempt to showcase what Liverpool could do when it pooled its resources, and to spark regeneration in the area. Whether or not this was a success, it completely reshaped the landscape. The area recently landfilled was developed into extensive gardens. Where the shaded bay of Knott’s Hole once looked out on the Mersey, the Garden Festival Hall provided the focal point for the event amidst the lakes, statues and artworks. Then the Festival ended, and once again the Dingle waterfront fell into disrepair. The years from 1984 until the turn of the Millennium were ones of little change. As planned, new housing was built in the area to replace the dense terraces built in the early 20th Century. A new waterfront drive took drivers quickly from Garston to the city centre, past the high fences and trees of the former Garden Festival site. In the mid 1990s Pleasure Island occupied the site, which meant a new use for the Hall and the Gardens themselves until the centre closed in 1999. Campaigns have run to help preserve or save the Garden Festival site from ruin or unsympathetic development. Finally in recent months plans have been submitted and accepted to build new houses and, more importantly, parkland on the site. So perhaps what began history as a secluded beach surrounded by the genteel houses of the wealthy will enjoy new life in the 21st Century as a green space for the people of Liverpool to enjoy. The keys were handed over to National Museums Liverpool from the developers last week, and now the pristine Museum of Liverpool is preparing for the installation of its exhibits ahead of the 2011 opening. The Liverpool Echo has a great slideshow of the museum, including the main entrance, the giant picture window, and the central spiral staircase. You can also sponsor part of the Jura stone cladding, or one of the seats in the auditorium. Just pop over to www.liverpool museums.org.uk/about/development/mol for more information. I’m looking forward to seeing it when it opens! Speaking of the museum, a new fused glass map which will take pride of place in the galleries when MoL opens next year is to go on display at the Daily Post’s offices in the city centre. There’s a blog on the Daily Post web site to keep you up to date with progress with the map. Now if only they’d do an electronic version I could stick on my site! Work begins on the International Garden Festival site. After 26 years, work is finally to start on the site of the 1984 Garden Festival. The Oriental gardens will be restored, lakes dredged and undergrowth cleared. Plenty of people in the Liverpool Echo article are ‘delighted’ at the ‘milestone’. 600 homes were built straight after the Festival, and Pleasure Island gave many a young schoolkid a fun Bank Holiday in the 1990s, but developers Langtree hope that this latest phase of building will create a worthy leisure facility for Merseyside and kick-start the collapsed apartment project from 2008. Two stories come together this week which conjure up memories of Liverpool in the 1980s (limited memories for me personally, as I was two when the Garden Festival was on!). Those who know their recent Liverpool history will be aware that Lord Heseltine was the initial force behind the 1984 Garden Festival, although the then ‘Minister for Merseyside’ was often criticised for ignoring the deeper problems of Liverpool, and settling for this rather ‘cosmetic’ and temporary fix. However, it has been pointed out that the festival raised the spirits of the region, and showed what a co-ordinated effort with the Merseyside Development Corporation could produce. Of related interest is the fact that Otterspool Promenade on which the festival site stands was created from the dumping of household waste and debris from the Queensway tunnels from the 1930s, a process which clearly had some detrimental impact on the river, and meant that the natural features of Otterspool and Dingle Point were lost beneath the concrete which later capped the promenade. It also goes to show that even recent history is constantly impacting on the landscape, shaping the city we live in! Feel free to share your Festival memories, or your views on the site in general! 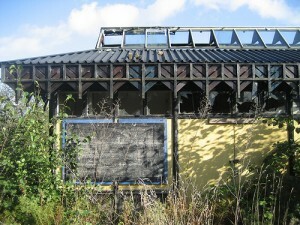 Note: The photo above is from a collection of photos of the derelict Garden Festival site by MC =) on Flickr. This is a great collection of photos, though tinged with a slight spookiness and desolation. Plus an abandoned typewriter. 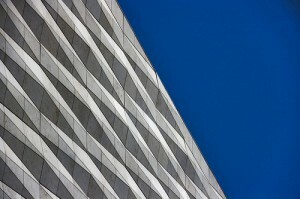 It’s full of Creative Commons goodness too, so have a look! Update: The BBC has reported that the Main Bridewell was sold at auction for £450,000 to a developer. Though the article mentions that ‘In 2004 developers discussed turning the building into a luxury hotel’, I will be waiting with bated breath to see what they actually do. One of those days when several interesting stories come along at once! Lowlands, the Grade II listed merchants villa in Hayman’s Green, West Derby has just reopened following a £1.2m restoration project. The villa was designed and constructed by Thomas Haigh (architect also of Marks & Spencer’s building in Church Street) and was owned and occupied by a succession of wealthy merchants and financiers. Vast areas of West Derby were occupied by similar men in the Victorian and Edwardian periods. The Inland Revenue occupied the buildings following war damage to the India Buildings on Dale Street in Liverpool city centre. Since 1957 it has been owned by the West Derby Community Association, and in the 1960s was a centre for the emerging Merseybeat scene, witnessing performances by the Quarrymen, Herman’s Hermits and Billy J. Kramer in the basement Pillar Club or the main hall upstairs. This history places it on similar ground to the Cashbar, the more famous club and coffee house just along the road at number 8. The Main Bridewell on Cheapside, just of Dale Street is going for auction and is expected to fetch up to £500,000. It’s proximity to the magistrates court on Dale Street means it was used to house defendants before trial, and was originally built in 1866 to hold petty criminals. The building closed in 1999.
for more information on why the Bridewell was so named, see the Encyclopedia.com question on the Bridewell. Finally, in a mysterious and disturbing story, original Victorian features are going missing from the area of Kensington in west Liverpool. Cobbles, cast-iron railings and original street signs are disappearing from the streets around Edinburgh and Leopold Roads, but no one (residents or the Council) seem to know who is pulling up these features. Rumour has it that the items (including stone setts taken from ships which used them as ballast on voyages from Turkey) are being sold on the black market. Areas removed are being replaced with tarmac. Anyone with information is being asked to contact the council.